Dust of Daylight Sessions presenterer våre favorittartister i en nedstrippet, intim og akustisk session. Det er artisten selv som velger låtene vedkommende ønsker å dele med vårt publikum, filmet i våre lokaler, backstage eller under lydsjekk. Vi har hatt besøk av artister som Mary Gauthier, John Murry, Ben Glover og Israel Nash. Vi har også filmet hele konsertsett med Robbie Fulks, Austin Lucas, John Murry, Stephen Simmons, Rod Picott, Robert Moses, Hakan Markussen, Ha Ha Tonka og mange mange flere. Vi er åpne for besøk i våre videolokaler, så ta gjerne kontakt hvis dette virker spennende. 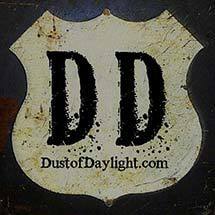 Dust of Daylight Sessions is the name of a series of video sessions, where our favorite artists shares a stripped down, intimate & acoustic session with our readers. The song selection is entirely down to the artist, and represents what the artist wants to share with our readers at that particular point in time. Previous guests include Mary Gauthier, Ben Glover, John Murry and Israel Nash. Whe have also taped and edited whole concert sets with Robbie Fulks, Austin Lucas, John Murry, Stephen Simmons, Rod Picott, Robert Moses, Hakan Markussen, Ha Ha Tonka and many many more..